I had the opportunity to spend one month at Choctaw Nation Health Service Authority. The Choctaws are one of the well known Five Civilized Tribes, so designated because of their advanced systems of government, education and law enforcement. When the Choctaw people were relocated from Alabama and Mississippi in 1820, the move was a peaceful one, and the tribe was given the entire southeast quadrant of what was to become Oklahoma (The state's name was derived from the Choctaw words for Red People). It is located in Talihina. 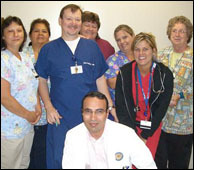 I worked at the Choctaw Nation Health Care Center. This center is a 124,000 square foot health facility with 37 hospital beds for inpatient care and 52 exam rooms. This hospital serves the 10.5 counties of southeastern Oklahoma. Four outpatient clinics and a diabetes treatment center make up the spokes of the integrated system. 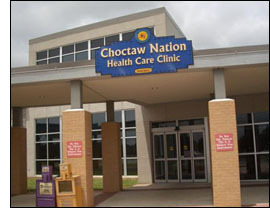 Choctaw Nation Health Service is funded by the Federal Government. Members of federally recognized Native American Indians and their descendants are eligible for services provided by the Indian Health Service. The Indian Health Service is the principal Federal health care provider and health advocate for native American peoples. Despite the Federal Government involvement and funding, Talihina is considered a medically underserved area. On average I saw approximately 20-25 patients daily. Many of these patients have chronic problems like hypertension and diabetes and have little if any knowledge about their medical problems. My main role was to educate the patients about their conditions and how to manage them. Choctaw Health center, being a small hospital, lacks a lot of the medical resources available in most hospitals, including imaging studies like MRI or Echocardiogram. If such studies were needed, the patient had to be sent to Tulsa (which is about 3 hour drive from Talihina) which delayed medical diagnosis and management. This was a great experience for me. I never before had the chance to work in a rural area with people from a different cultural background. I believe this experience added to my medical knowledge as well as my social interactions. I feel glad to have been part of such service. I also like to thank the Atlantic Health (and the Benjamin H. Jospehson MD Fund) for making this experience possible.